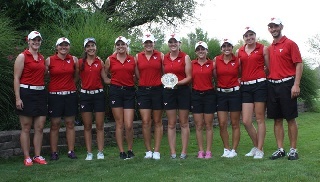 Vienna, Ohio - The Youngstown State women's golf team earned a four-shot win over Northern Kentucky and Cleveland State in the four-team 36-hole YSU Kickoff at the Candywood Golf Club on Monday. YSU's Emily Dixon won the event by two strokes with a 146. The Penguins carded rounds of 301 and 303 on the day for a total of 604. Cleveland State (303-305) and Northern Kentucky (303-305) tied for second with a 608 while Chicago State (310-310) was fourth with a 620. Dixon had rounds of 75 and 71 on the afternoon and used a strong final 18 holes to claim the title. She was three shots behind Cleveland State's Rachel Johnson and two behind CSU's Hannah Bennie after the opening round. Dixon was one-under par on the final 18 holes to best Johnson (148) by two shots. In her one-under par second round, Dixon was three-under par on the front nine. She birdied No. 2, No. 5, No. 7 and No. 8 to offset a bogey at No. 3. She was two-over par on the final nine holes, but clamied the win with a three-over par final total. For the Guins, three golfers carded 155's to finish tied for 11th. Courtney Shutt (78-77), Mia Barchetti (72-83) and Megan Creager (76-79) each finished with that score. Barchetti was tied with Johnson for the first round lead with her one-over par first round. Freshman Gabby Minor carded a 158 (82-76) in her debut. Golfing as an individual, Christina Cooper finished fifth a 151 after carding scores of 77 and 74. Also for YSU, Emily Rohanna had a 159 (79-80) while Haleigh Guerrero had a 162 (83-79). The Penguins are next in action on Sept. 5-6 at the PSU Nittany Lion Invitational.